Who We Are: Founded in 2008, the New Children’s Hospital Alliance (NCHA) is a group of health professionals, parents, grandparents, ex-patients and other interested persons from all over Ireland who wish to ensure that the correct decisions are taken regarding the location of the new National Paediatric Hospital (NPH). Children must be central to all considerations of the development of their new hospital. New Children’s Hospital Alliance Goal: As a nation, to provide the highest quality of care for our children as measured by patient outcome and patient experience. More than four thousand supporters registered over a 5 month period with our website in support of our campaign to have an independent review of the process of the choice of Mater site. Registration finished in March 2011. [Sadly, the Taoiseach reneged on Fine Gael’s pre-election promise to review “the entire process” opting instead in June 2011 for a limited financial review using three comparator ‘notional ‘sites, and a clinical analysis which did not address its terms of reference]. 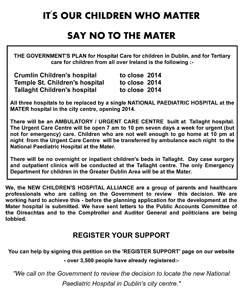 Our website www.thenewchildrenshospital.ie is designed to record the debate so far and to reflect our serious concerns -concerns originally regarding the process which led to the decision to locate the hospital on the site of the Mater Campus, and now, since the rejection of the Mater site by An Bord Pleanála in Feb 2012, with the continued blinkered obsession of the Dept. of Health with placing the only truly national hospital in the country on the grounds of a adult hospital. Other more important requirements for children are sidelined while the ambitions of adult institutions are given free play. Madam, – We, the undersigned, like Maurice Neligan (Irish Times, HEALTHplus, July 27th, 2010), have had the privilege of spending most of our professional lives caring for sick children. Between us we have worked in all three Dublin children’s and maternity hospitals, in Irish regional and county hospitals and in many leading paediatric hospitals in North America, Australia and the UK. Dr MARY WALDRON, paediatric nephrologist. Prof CONOR WARD, Prof emeritus of paediatrics UCD. 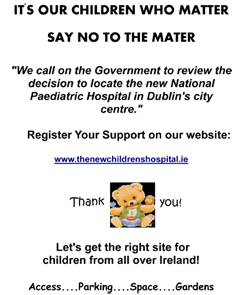 Prior to the General Election in 2011 we ran a campaign calling on the government to have an Independent Review of the site selection for the new children’s hospital. This campaign closed with the election of the new government and its promise to hold such a review. Below are the fliers used in the campaign. Please note that registration for support of the campaign closed March 2011.